The academic hood is a visual representation of your level of academic achievement and the degree conferred. An academic hood has three distinct components: the shell, the lining and the velvet trim. 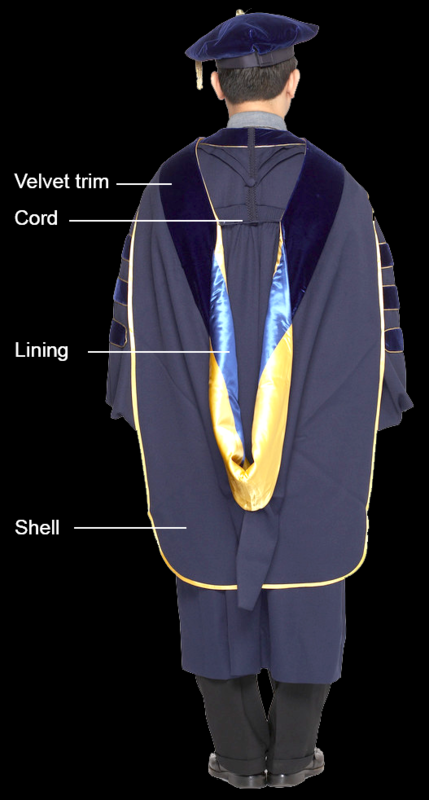 In general, the shell of the hood matches the academic robes, the lining shows off your institution’s colors and the velvet trim indicates the field in which you are receiving your degree. A Master’s degree hood is 3.5 feet long and comes to a point at the bottom. A Doctoral hood is the longest hood at 4 feet long. It has the sharpest point and also the largest trim of all hoods. Put the hood on over your head with the velvet side up and with the small tapered end in front. If the hood has a cord and button, attach the hood neck cord over a shirt button before closing the gown, preventing the hood from riding against the neck. Ask a friend, family member, or colleague to help you fold the hood properly. If your hood has a cord, secure it across the back to keep it together. Your friend should flip the hood to make sure that the colors are prominent. The fold should take place just beneath the shoulders.